The Galileo 5 was an advanced short-range vessel able to operate in space and in a planetary atmosphere. The Galileo 5 and her sister shuttlecraft the Copernicus 3 were important components of the USS Enterprise NCC-1701-A's transporation system. They were short-range vessels used primarily for ship-to-shore transporation and for sublight travel. They also provided an effective backup if the ship's transporters were offline. The Galileo was one in a long line of Enterprise shuttles called Galileo, and is named for early 17th century Italian astronomer, mathematician, and physicist who designed and built the first astronomical telescope and discovered the four largest moons of Jupiter. This Galileo had an aerodynamic design, and was highly maneuverable. The shuttlecraft was normally entered via a hatch on the starboard side of the craft, and a short flight of stairs allowed the passengers to disembark in the shuttlebay; a large hatch in the aft section allowed for cargo loading, and enabled greater numbers of personnel to board the shuttle quickly. The cabin area was relatively spartan, and could safely accomodate more than 10 people. The seating arrangement was for two pilot's chairs and four chairs along the wall of the main cabin. Other personnel could stand quite safely during flight operations. At the front of the Galileo, a control console showed flight information and other visuals. A weapons drawer containing several phasers was located underneath. The wide cockpit window provided excellent sight-lines for the pilot. The Galileo normally landed in the main shuttlebay at the rear of the engineering hull. 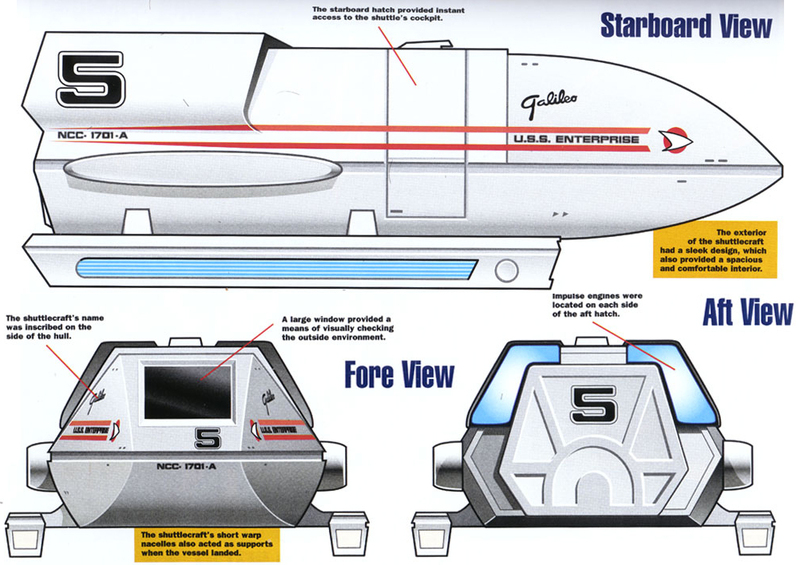 Once the shuttlecraft was in range of the tractor beam, manual control was given over to the computer, and the shuttlecraft was brought directly into the shuttlebay. In emergencies, the shuttle could land manually. This was difficult at normal speeds and extremely risky at high speed. One landing of this kind severely damaged the Galileo; the shuttle clipped its nose on the exterior hanger of the shuttlebay before crashing into the barrier nets at the rear of the bay. "U.S.S. ENTERPRISE NCC-1701-A" - APRIL 2000 ISSUE 12 STAR TREK: THE MAGAZINE COPYRIGHT OF PARAMOUNT PICTURES.